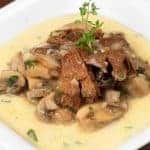 If you are looking for a recipe with a perfect blend of rich flavor and elegant presentation for a special dinner party, you may want to give this one a try. It is surprisingly easy to prepare, and with a little planning in advance, it really doesn’t require a lot of last-minute fuss. 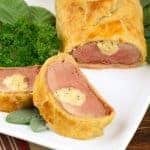 Brandy, apples and sage flavor this beautifully presented pork tenderloin, accented by a sweet-savory cream cheese filling and wrapped in puff pastry. Preheat the oven to 400°F and line a large, shallow baking pan with parchment paper. In a small bowl, combine the cream cheese, dried apples, garlic and sage until well blended. Set aside. 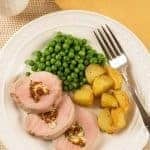 Trim the silver skin and any excess fat from the pork, then cut a 3/4-inch deep slit down the length of each tenderloin for the filling. Spread half of the cream cheese mixture inside each slit and gently press the tenderloins back together, being careful not to squeeze out the filling. Depending on the length of the tenderloins, lay 5 or 6 slices of the prosciutto on a sheet of wax paper, overlapping the top edges slightly. Place a tenderloin, filling side down, on top of them and wrap the prosciutto slices around it. Repeat the process with the other tenderloin. Heat 1 tablespoon of the olive oil over medium-high heat in a skillet large enough in diameter to accommodate the length of the tenderloins. Carefully add one tenderloin and sear it lightly on all sides to “seal” the prosciutto wrapping. Transfer to a plate, add the other tablespoon of oil to the pan and sear the other tenderloin. Set both aside to cool for about 10 minutes. Trim a strip about 1-inch wide from one side of each pastry sheet and reserve for decoration if desired. Roll each sheet to a 12 x 15-inch rectangle. 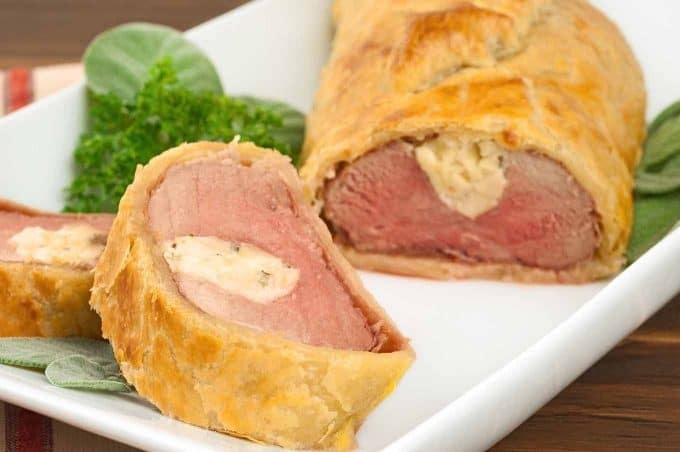 Place one tenderloin on each sheet of pastry, filling side down. Bring the long sides of the pastry up over the tenderloins and press the edges together to seal. Gently turn right side up, crimp the ends and fold them under to finish the seal. If desired, use the reserved pastry strips to make some decorative cutouts for the top of each tenderloin. Place the tenderloins, seam side down, on the prepared baking sheet. Brush the top and sides of the pastry with the egg wash. Gently press any decorative cutouts on top, then brush with the egg wash a second time. 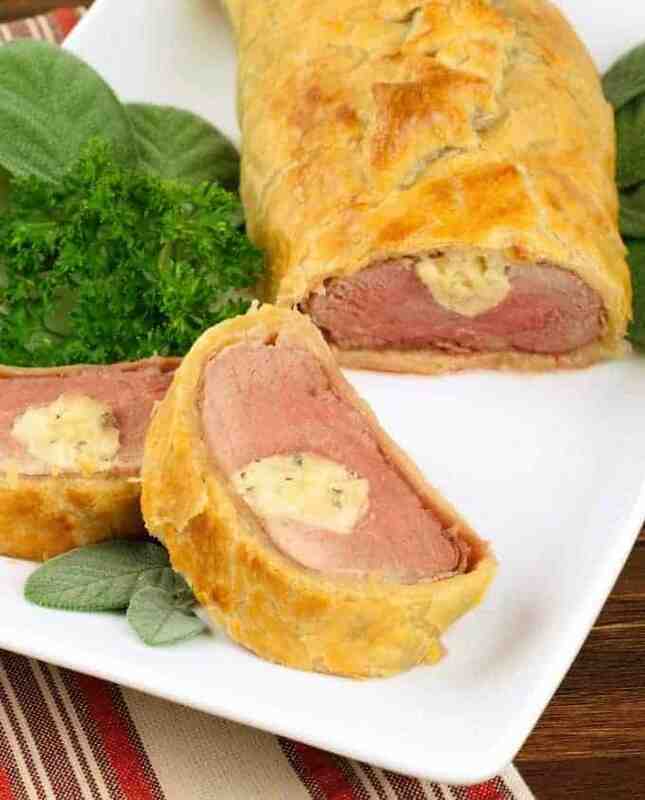 Bake for 20 to 30 minutes, until the pastry is golden brown and the pork reaches an internal temperature of 140°F. Allow the tenderloins to rest for 7 to 8 minutes before slicing. While the tenderloins bake, melt the butter in a saucepan over medium-high heat. Add the chopped shallot and cook until soft and fragrant, 3 to 4 minutes. Add the apple cider and brandy, turn up the heat and bring the mixture to a rapid simmer. Cook until the volume is reduced to about 1 cup, 10 to 12 minutes. 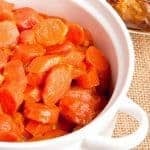 Mix the cornstarch and water together in a small bowl, add to the cider mixture and cook, stirring until slightly thickened. Stir in the chopped sage, cook 1 minute longer, then transfer to a serving serving bowl. To serve, slice the pork into 1/2 to 3/4-inch thick slices. We’ve found that a long serrated knife like a bread knife works best for cutting through the pastry without crumbling it. Arrange the slices on a platter and pass the sauce at the table. 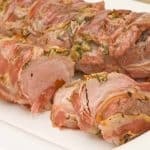 If your pork tenderloins taper a lot at one end, try folding the ends under prior to wrapping with the prosciutto. You can also cut them off and reserve for another use if you prefer. This would be the perfect holiday dinner can wait for Christmas! This is so elegant and beautiful….I will serve this for my family soon!!! !